Dental local anesthetics are the numbing agents dentist use to ensure local anesthesia of teeth and gums in order to do our work. There are several types of anesthetic we can use and several techniques from which we can choose to deliver it. Dental anesthetics are either amide or ester. Many contain the vasopressors epinephrine or levonordefrin and thus will have sodium metabisulfite preservative. Levonordefrin is a sympathomimetic amine we use as a vasoconstrictor and epinephrine restricts arteries in skin and tissue as part of it’s fight or flight response. Both vasopressors sting. Tissue type – soft tissue lasts longer than pulpal. Lidocaine – use 1:200k instead of 1:1ook since same effectiveness and less risk, use 1:50k for hemostasis. We consider lidocaine and prilocaine the safest local anesthetic for use during pregnancy. Bupivicaine – only long lasting if block and in soft tissue NOT for pulpal if infiltration. Highest lipid solubility so can work at very low concentrations. Prilocaine is short acting, only lasts 40-60 pulpal if block and only 5-10 if infiltrate. It is the least painful during injection so some will use first. Prilocaine works well on hard to anesthetize patients. Prilocaine w epi – similar lido and mep but since 4% higher toxicity so don’t bother except……. I have an entire blog post on the articaine v lidocaine argument. Methemoglobinemia will show clinically as blue lips and shortness of breath. It can result from benzocaine, prilocaine, and to a lesser extent lidocaine and possibly articaine. TCA (Tricyclic antidepressants) and epinephrine can cause high blood pressure and heart rhythm issues. This seems to be pretty low risk in dentistry. Below is a partial list of TCAs. Non specific Beta blockers and epinephrine can cause a stroke, however, the doses we use are likely too low even if an inadvertent direct vein or artery injection occurs. Below is a list of non selective Beta blockers. Alpha blockers and phenothiazines can cause epinephrine reversal with results in vasodilation and we see short action of local anesthetic and more bleeding. If on these then we switch to levonordefrin anesthetic. Very unlikely to be on an alpha blocker. This is a list of the common dental local anesthetics used in dentistry and how much can be used on a patient by weight. 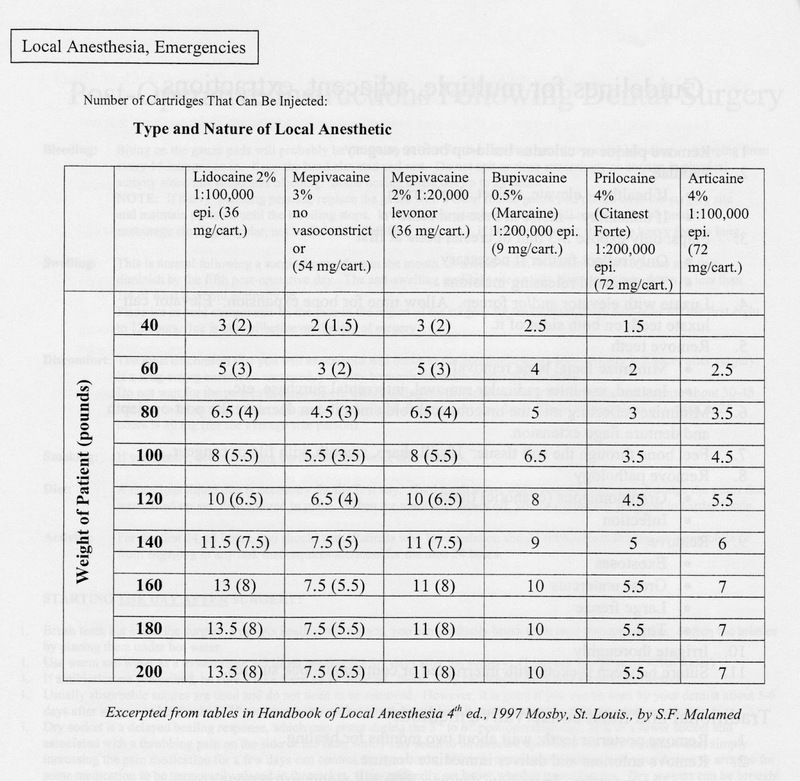 Most dental local anesthetics are about 2mg/lb. However, bupivicaine is about .5mg/lb which is why despite it being only .5% the number of carpules max is about the same as the 2% anesthetics. That works out to 1 carp of 2% dental anesthetic for every 20lbs. The formula % x20=mg/carpule is also useful. Dental anesthetic injection techniques vary from dentist to dentist. I will cover a few studies on techniques in this section. An interesting study I ran across in JOE was on the impact of IAN injection and patient positioning. I was unaware that having the patient remain in the supine position results in slightly better success rates of anesthesia. No difference in pain or time of onset found in study however, this study is on maxillary molars in kids. Why even bother with the wand in maxilla? We have an entire post on dental anesthetic nerve damage. Having mandibular nerve block failures? Switch dental local anesthetic type, which is good advice for any failures not just blocks. Try switching to Gow-Gates (many feel this is superior from the get go). Also would likely get any bifurcated mandibular nerves which are thought to occur .1-.9% (pretty low really) and innervation from long buccal through the retromolar foramina.